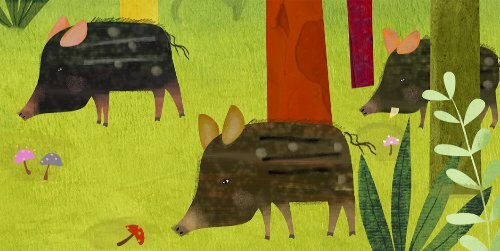 Every now and then at 7-Imp, I like to give the spotlight over to those who create illustrations for the wee’est of all wee readers. One such illustrator is visiting today, and her name is Amy Schimler. 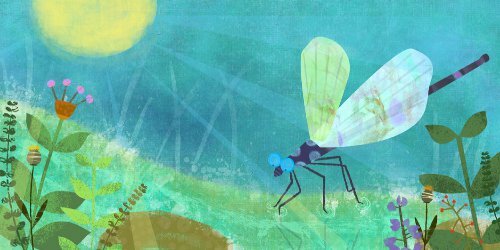 Her bright, colorful art work all about nature, geared for the big eyes of the youngest of children, is also fitting right now, given that Spring is upon us. Here in Tennessee, Spring graced us and then pulled back a bit, so at this point, I’m ready to dive into Amy’s world and live there a bit until Spring regains her senses and descends upon us again. Without further ado, here’s Amy. 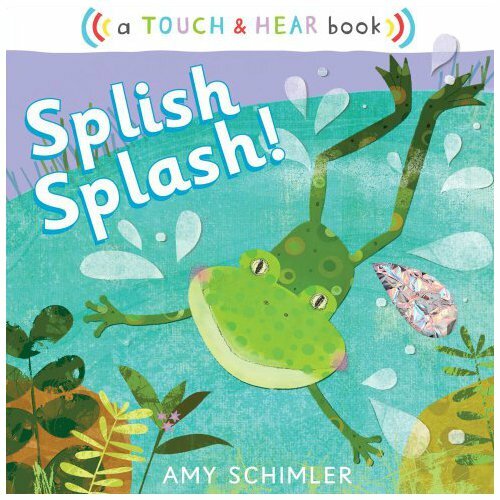 Amy: Splish Splash is an interactive board book, published by Little Simon. 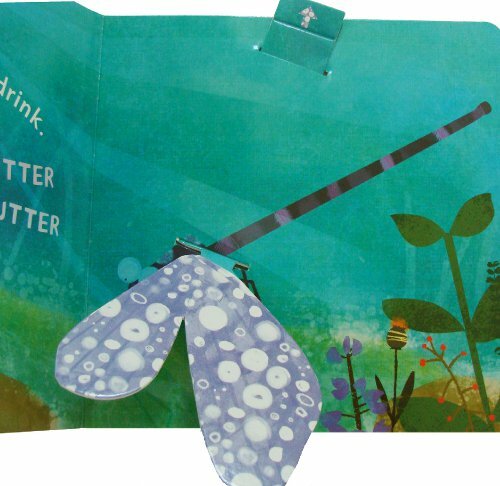 It is a “touch and hear” book, which incorporates a variety of fun materials that mimic the sounds of the animals in the book. 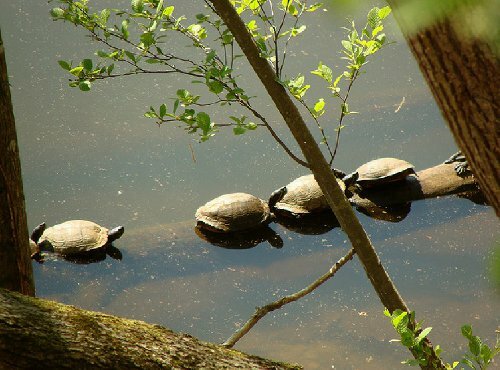 In this case, animals which you might find along a river’s bank or by a lake or pond. My art director did a very creative job sourcing the appropriate materials to make the various sounds. I especially love the munching beaver (the reader rubs his/her finger on a swatch of Velcro embedded in a log). when the tab is pulled. The original illustration for the back cover. This book was inspired by where I live outside of Atlanta, Georgia. My house is on a lake surrounded by critters that inspire me on my daily walks. 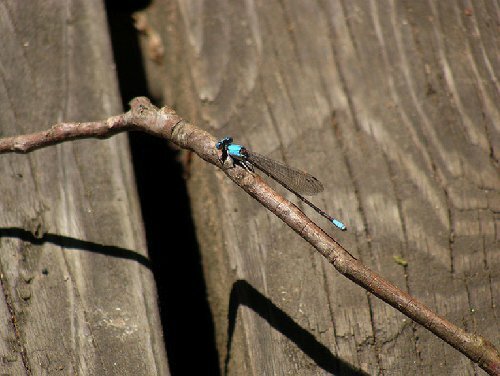 Blue-headed dragonfly near the lake by my house. I began my illustration career as a textile designer. I continue to sell my pattern designs in addition to illustrating children’s books. 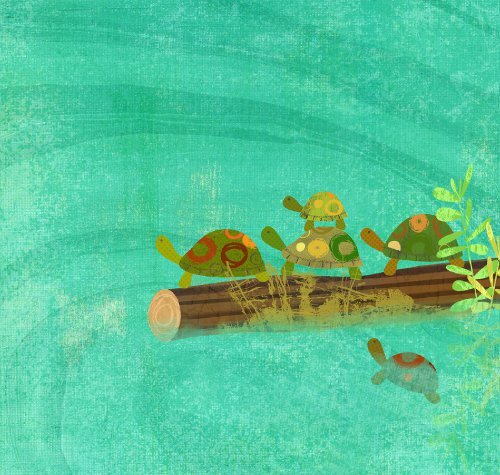 Another page from Splish Splash. 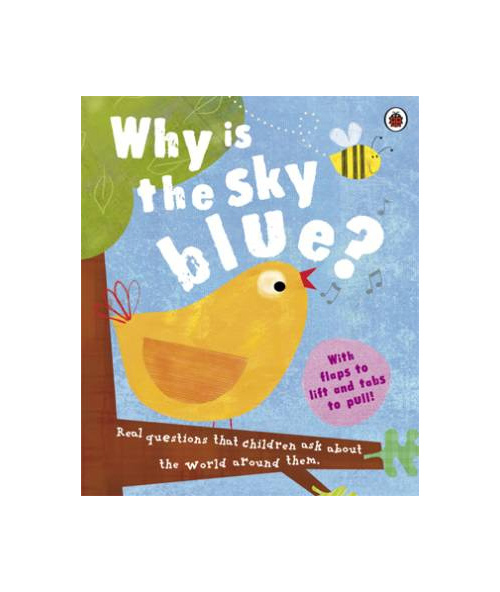 In 2010, I was honored to find out that a book I illustrated, Why is the Sky Blue?, published by Ladybird Books, was chosen by Booktime.org in the UK as one of their featured books, along with Eric Carle’s “Slowly, Slowly, Slowly,” Said the Sloth. Over 750,000 book bags were distributed in the UK to first-year state school students. 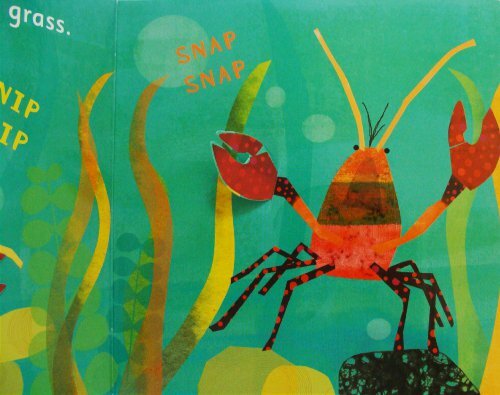 Another book I illustrated for Little Simon. Many thanks to Amy for visiting. I hope those colors woke you up as they did me, even before I had coffee in hand. 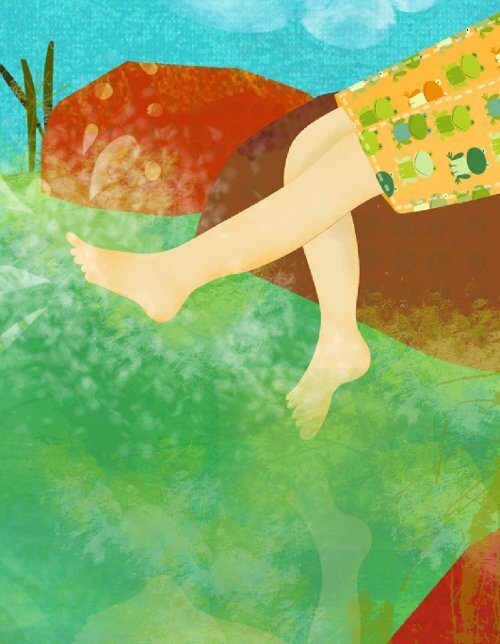 All illustrations are © 2011 Amy Schimler and used with permissions. 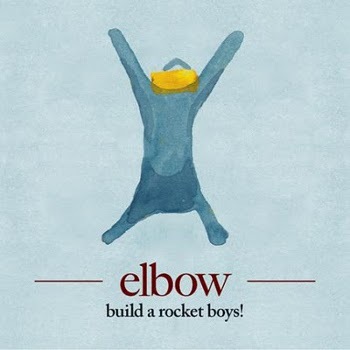 The new Elbow CD, build a rocket boys!, significantly improved the quality of my days this week. Sweet heavenly poodles in hot air balloons (I don’t know where that came from…it just came off my fingers, and I’m gonna leave it), it is GREAT. Every time I’m done listening to an Elbow CD, I just want to hang out with Guy Garvey. And his choirs. I want to be his friend and have him give me a gentle shoulder charge and bust me out with his hacksaw (I know, I know, slightly baffling, but just get the new CD already, as you won’t be disappointed anyway) and ride shotgun in his car and pound my fists on the table with him over some beers. Yup. Anyway. The new CD is pretty much flawless. Also: Where has Raphael Saadiq been all my life? 3). I finally watched Get Low on DVD, which I had wanted to see in the theater when it initially came out in 2009, and that beautiful film broke. my. heart. 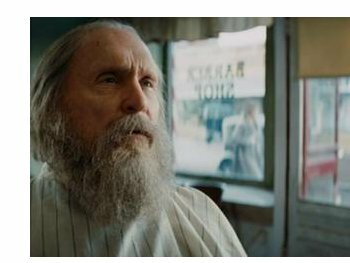 Where was Duvall’s Oscar nomination that year? For shame. 6). In the realm of Picture Book Kicks: Hubba wow, is this collection of wisdom something 7-Imp is cheering loudly in the sidelines. I’ll even throw in some spirit fingers. And check out this Sendak-sighting and bit of thrilling news. Thanks, Jules. Great post, lovely art. See you Saturday! Of human matter, and dropped down too. Of a cumulus cloud, before moving inside. Shadra, the Spring puddles are exuberant! 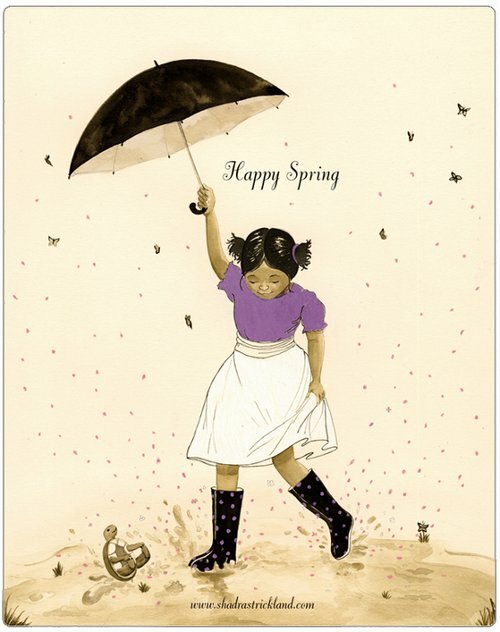 I know I had spring in my grasp not long ago….its gone now. 6. relaxing while three sick kids are sleeping the day away. Hi guys, I’ve missed kicking with you! But we now have moved in, have a table and internet so I’m all set. Amy your kicks sound very cozy! 3. Getting to see our niece change week by week – she took her first steps alone a few days ago! 4. Small things about the house are still exciting. Having my own sturdy washing line (as opposed to airer that flips over in high winds). Finding new plants in the garden we hadn’t noticed before. 6. I had to do a four-wheel-drive course for work during the week, and as I am not a confident driver was not looking forward to it, but it went really well. I got a lot out of it. I want that dragonfly, both the picture and the photo. Amy’s book is so springish,love it! Shadra captures the best part about spring:puddles! Steven, thank you for each week’s poem. Amy, your list is a poem and Emmaco, glad to read you are settling in. 1. Oldest grandgirl and writing a story together. 2. The support for libraries at the budget meeting this week. Still don’t know our status for next year. 3. The student poems are shaping up. 4. Prepping for National Poetry Month. 7. Internet Free Zone during spring break. Jules, I want to go to South by Southwest with you! And I should buy a copy of Splish Splash for baby Kezhia, huh? 1. My baby niece Kezhiaaaaaaaaaahhhhhhhh! 2. Playing games with my younger cousin Lina. Heeheehee. 3. Happy Lemon, a bubble tea (boba) place from Hong Kong with a new branch here in the Philippines. 6. Not being afraid to sing and dance along to songs being played in restaurants. Hahaha! 7. Jules is on Twitter. Wooooooot! 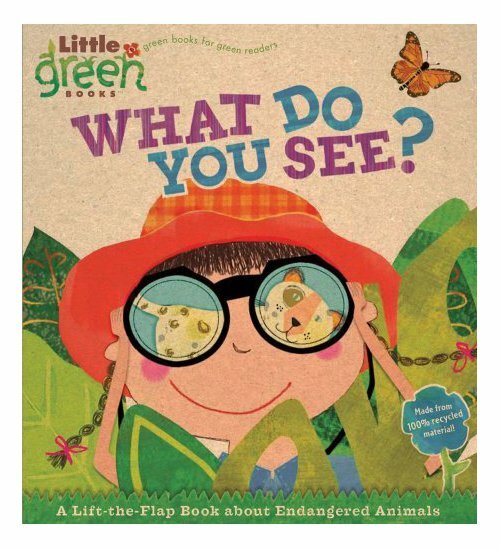 On a more serious note, a question: of Amy’s book covers reproduced here, only one includes her (or anyone else’s) name. That (I mean, omitting the name) is not a common practice, is it? Jules, I’m sorry, but I had to laugh when I read about you writing down “trampled by turtles” and then forgetting what it referred to. I was just thinking about how complicated your, uh, mental work process must be. I mean, I know you listen to things like Pandora and Ping and plain-old CDs and so on, and always imagined that in your own Pivot Interview you’d have to confess to never doing without music. So I was just thinking how difficult it must be to be so hooked on good music: that you must have to stop what you’re doing every 5-10 minutes, asking yourself What was THAT?!? and writing down a note to yourself for later exploration… And then, there you were in this post. Being entrampled. Thanks for the reminder about Get Low. Queueueued. Thank you as always for the poem, Steven — and for helping the lost dog! Ah, emmaco — back to your classic through-the-looking-glass form, I see. “There even whipbirds”: as in, “Well, well, well, whipbirds are present, too — who’d have thunk?! ?” While the rest of us are all, like, Whipbirds? WHIPBIRDS?!? jone — there was a time, I know, when I never checked email (or later, the Web), not even once, for a whole week. I think it might’ve been around October, 1958. Good for you for pulling it off. (1) Still basking in the afterglow from SibFest ’11, especially now that we’re all trying to consolidate our photos into a single slideshow. Even if no one but us ever looks at ’em all, they still (for us) sort of say: This is why we did this. (3) Which makes me wonder how many UFO reports are based on sound (or, I don’t know, maybe smell and taste and touch) instead of visuals. (5) Finally watched Zombieland last night. Many, many spit-takes. And then followed it up with The Blues Brothers. More of the same (and some of the latter spit-takes were tinged with nostalgia, which makes them even better). (6) Finished Mary Doria Russell’s The Sparrow. What a great book! (7) During the SibFest, part of my mind was occupied with thoughts of how I might resolve some outstanding problems in the Work In Progress. Now chomping at the bit to get back to it. (Bonus) This may jeopardize any hopes I have of ever being taken seriously as a music listener, but this week I downloaded the MP3s of John Denver’s 1970-something An Evening with… album and, zomg, it’s as good as I remembered. (Bonus Bonus) I found out the source of the “z” in “zomg.” My life is complete. JOHN E. SIMPSON! You found the Channing performance. How did you find it? I looked and looked and LOOKED yesterday. I swear, now I’m adding a missed calling to your already long list of missed callings (in my head anyway): Information Science. You’re a web ninja. p.s. I LOVE JOHN DENVER. Hi again, all. It’s so nice to see visitors every week. I see things like social media sites making people comment less, which is fine. Really, it is. I’m not going to complain about the way the tide is rolling. But that’s to say that it’s nice some folks still stop by to share kicks. Almost seems old-fashioned, given the prevalence of things like Facebook and Twitter. Steven, thanks for our (almost) weekly poems. Still pondering that lovely one you shared today. REALLY looking forward to meeting you this week. Amy, yes! Those kicks do read like a poem. Ah. I want a heater next to my feet. Emmaco! So nice to hear from you. So glad you’re settling in. What I Learned From You This Week = whipbirds. (Always something. How much do I love how John described your kicks as through-the-looking-glass?) Enjoy the breakfast. Congrats on overcoming the drive course. Jone, I always look forward to the student poems. Happy almost-Spring Break. Big plans? Tarie, me, you, South by Southwest one day. It’s a plan. But first we must meet one day. (Let’s just meet there.) Preferably your OBSCENELY CUTE niece will be with you. Ah, thanks for the Twitter welcome. I’m still stumbling around. It’s mostly for blog and Kirkus stuff. John, good question about the book covers. Maybe Amy can weigh in?…If you watch Get Low, tell me what you think! I think there were a FEW, tee-niny holes/questions I was left with that perhaps the movie should have taken care of, but the story? The acting? Hubba whoa. It helps I knew nothing about the plot. Please try to go into it, knowing nothing about the plot. …. I just fell in love with kick #2, John. Love Zombieland. … So glad, again, that you enjoyed SibFest. And PLEASE DO TELL: What is the “z” for? And no, really. I love John Denver. Anyone who wants to make fun of him can do so behind my back, all whispery, please. I ask. Well, the trick is that the “z” — allegedly, I guess I should say — doesn’t really stand for anything. They say that its first occurrence, whence it boiled out into the outside world, was in some sort of gamers’ chat/IRC session. Somebody wanted to type “omg” in all caps but missed the left-Shift key and hit the “z” instead. Everybody was so taken with it (it IS sort of charming) that they just went with it as a form of omg-emphasis from then on. So glad you like John Denver, too! The Missus had asked me to download some JD music for her, so my first go-round was with something called The Essential John Denver because it seemed the most complete. But because I’ve got that live-concert album burned into my synapses, I couldn’t get used to the order of the songs — or their studio/single versions. So it was all, like, y’know, Hello again, Amazon MP3 page… I’m back! That makes me like him even more. You should hear The Innocence Mission cover “Follow Me.” Well, here you go: http://tinyurl.com/49vldth. Enjoy. Late kicks, mostly due to technical difficulties (I have a more colorful term for those, but I will spare you). This is a great place to come to raise one’s spirits, so thank you all for that. Jules, thanks for all the great music, especially Middle Brother (great harmonies), and for our impromptu chat, which brightened my day. Steven, lovely poem, as always. Amy, I spent a longer than usual amount of time in my pj’s and wooly socks today also. Seems like that kind of day. Emmaco, love your kick about unpacking your books — I think of my books as friends also. Jone, good luck with the internet-free zone! Not sure I could pull that off, but it’s a good goal to have. Tarie, I love names like “Happy Lemon”, and I’m always looking for new tea places. JES, love your description of the call of the bird sounding like a flying saucer. With the way things have been going in the world lately, it wouldn’t phase me at all if you told us that it actually WAS a flying saucer. Oh, and thanks for sticking “Rocky Mountain High” in my head. 1) Getting to see Hal Holbrook as Mark Twain last night in San Rafael. AMAZING. Just flat out, jaw-droppingly fabulous. Holbrook is 85 years old, and he has 2 hours of material committed to memory, which he executes flawlessly. It was an honor to be in his presence. 2) Visiting with my brother last weekend and having a lot of laughs. 4) Seeing the movie “The Lincoln Lawyer”. Nothing Academy Award-worthy, but a good solid drama. Matthew McConaughey isn’t bad on the eyes, either. 7) A sun-filled forecast for this coming week, which I can’t wait to experience after all of this rain! 1. I cannot resist a staircase. On my walk today, I decided to go up the water tower stairs seven times. The first sets of any stair-climb is the hardest for me, so when I was into the groove of repeated journeys up the water tower, I had to smile as people tromped upward, groaning about how hard it was. It is. But it does get not-as-hard. 2. I’m going to be 39 tomorrow. I’m not quite sure what I think about that. It’s going to happen, regardless of what I think of it. However, there is a pedicure in the deal, plus a glass of Lillet with a friend. 3. Most days, I get five fresh fruits and veggies into the family. That is an accomplishment. 4. I’ve told my immediate family that all I want from them for my birthday is original artwork. The man and the girl have been busy and secretive all day. 5. I have good friends. 6. When my husband and I send our daughter to the bathroom to get ready for bed, we start an hour early. She dances around in the bathroom for 45 minutes and we get a breather. 7. Tomorrow morning there will be coffee. Happy last week of March 2011, everyone! Jill, thanks for the links. I shall explore. So good to catch up today. Farida, happy early birthday. You go on with your bad self and those staircases. I have good friends, too. Isn’t it the most supreme kick? Enjoy that coffee. New Elbow album… YES! Must have it! Also, love that Shadra Strickland print, which isn’t surprising as I’ve loved every single thing she has ever touched. Jules, I love your music kicks, although I admit sometimes it takes me a couple of days to listen to all of them. : ) And I definitely remind myself that some standouts should be included in kicks every week. Steven – hooray for helping a lost dog! Amy – wooly socks a toasty heater and pajamas sounds like a perfect Sunday morning. Jone – Hope you have a great spring break! I couldn’t last a whole week when I tried internet-free, I made it a whopping 3 days – hope you have much more success than I did. JES – Glad SibFest was a success. Must check the Carol Channing video. John Denver and The Muppets Christmas Album is on my playlist every year…gotta love him. Farida – congrats again on your stair-climbing accomplishment. And happy early birthday to you – pedicures are a fabulous way to celebrate! 1) Wonderful vet called this morning, Saturday’s test results for Ingrid came back normal, so she’s still doing well. And is still a very happy dog. Which makes me happy. 2) Indoor soccer game today. We lost, but it feels so good to run like hell, and push yourself. 4) A Saturday of work, errands, and accomplishing things. 5) Which gave me a Sunday morning to sleep in. 7) Took an optimism test at Oprah.com, and I am a Super-Optimist. Apparently we super-optimists recover from adversity well, but are prone to accidents due to being over-confident and taking risks. Good to know. Next time I’ll slow down instead of speeding up at the yellow light. JES, you are one to talk about being through the looking glass when you have flying saucer birds whizzing around your head! Very cool indeed. But I am glad to know that living in Australia is still different enough to the US that I can continue to amaze folks with everyday things (as you all do for me every week!). Farida, I was also sad about Diana Wynne Jones dying, as I love her books too (including Dogsbody). You are sounding very healthy what with all the stair walking and fruit&veg eating. Happy Birthday! Glad your dog is healthy, Rachel! Sam, glad you like Shadra’s work. New Elbow CD is flawless. Emmaco and Farida and everyone, may Ms. Jones rest in peace. And wow to that video, Rachel. I didn’t even know that a sole stall was a THING someone did till now.